Back in 1967, John W. Campbell of Analog, published Weyr Search which went on to become the first part of Dragonflight. He chose artist John Schoenherr to do both the cover and interior illustrations. He also did the cover for the first part of Dragonrider and all the interior illustrations for both parts. I was thrilled when John’s son, Ian, contacted me to ask if he could post Mum’s letter up on John’s memorial website. You can see it and some of the magnificent illustrations here. 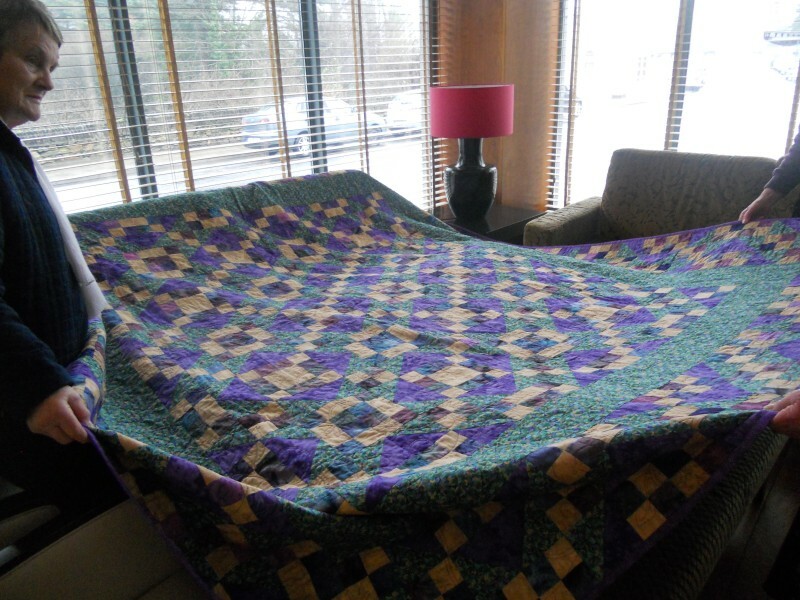 Anne McCaffrey became a major quilter in the last years of her life. 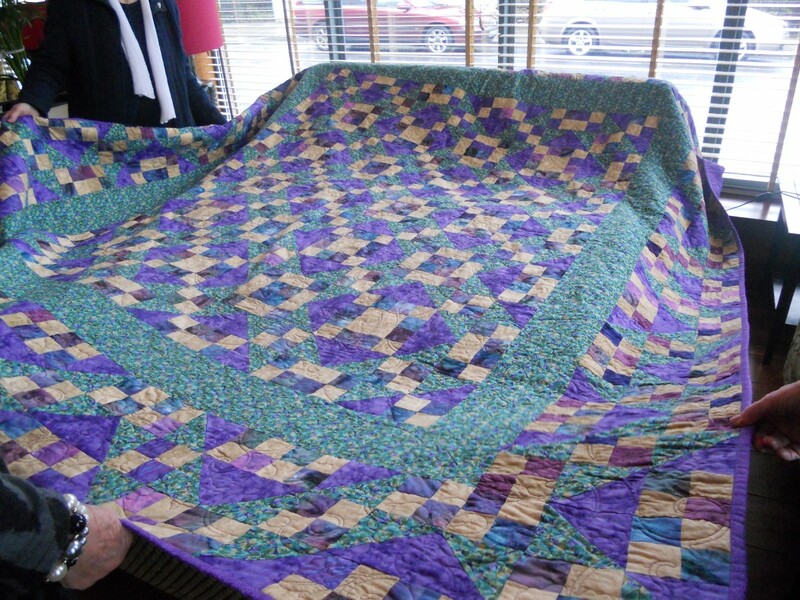 Naturally, still hoping to do many more quilts, she had amassed a huge backlog of material which remained after she passed away. We’re very pleased that we managed to find a home for all the materials. 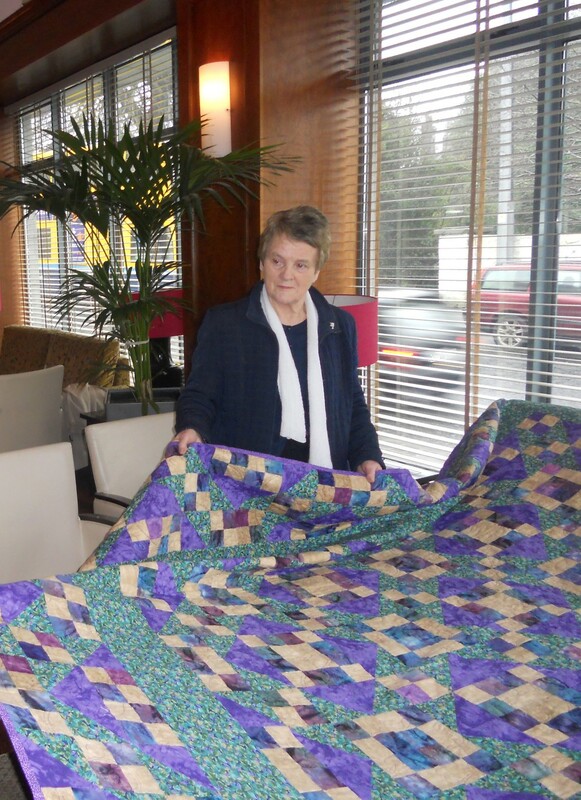 The Irish Countrywoman’s Association (ICA) took the material and, in short order, produced a magnificent quilt. Anne’s great friend, Maureen Beirne, arranged for Gigi to see the finished quilt and to meet the three ladies who made it. The pattern used here is a Jacob’s Ladder. Quilters Rita Conalty (left) and Terry Newsome (right). 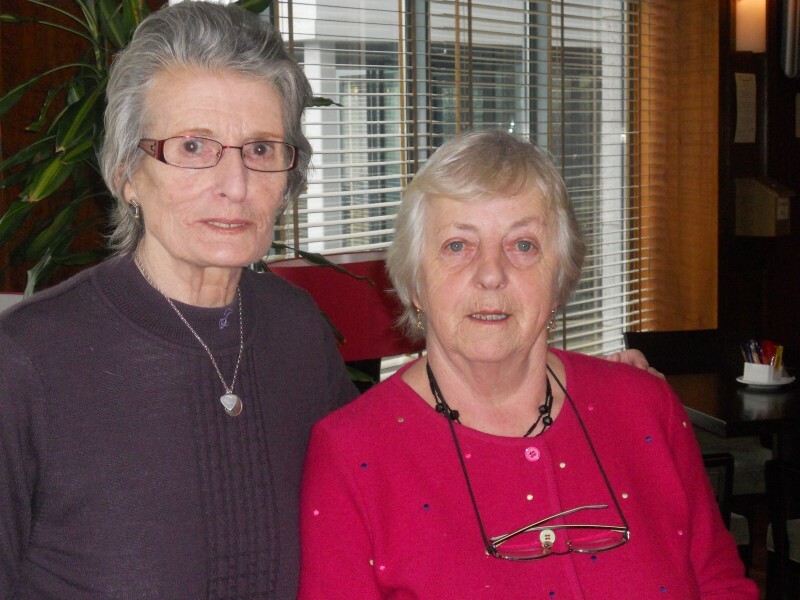 We’re very grateful to the ladies of the ICA and particularly to Maureen Beirne for all their efforts. 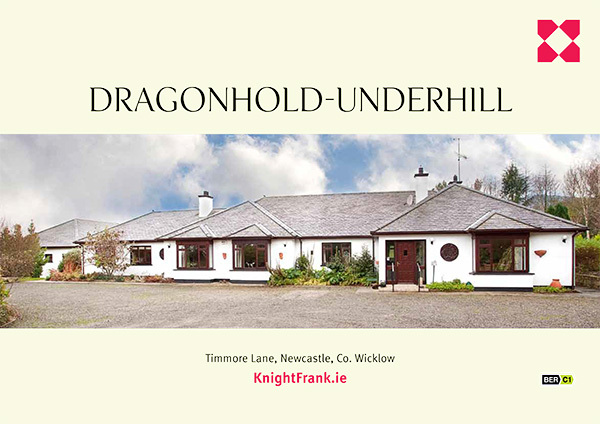 Fittingly enough, today — Valentine’s Day — Mum’s house in Ireland has been put on sale. This is the eulogy Alec Johnson, Anne’s eldest son, read in the funeral service held for Anne McCaffrey November 26th, 2011. 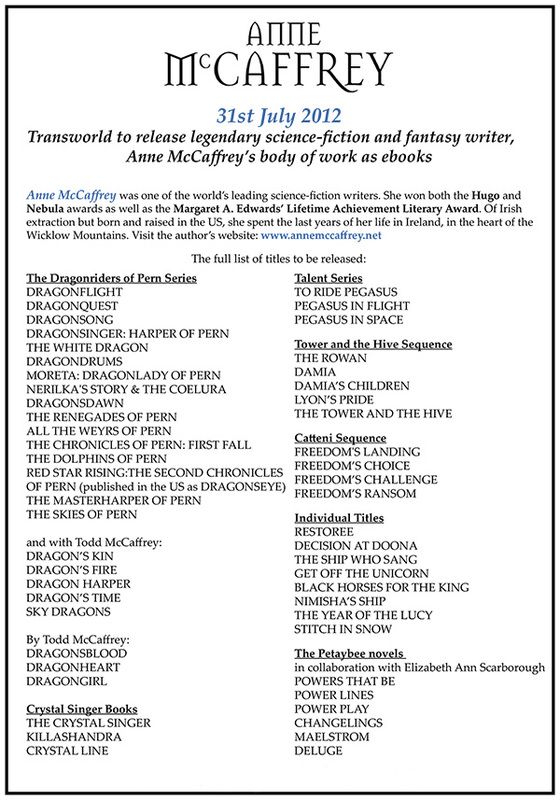 For nearly 60 years it’s been my distinct honor to be Anne McCaffrey’s eldest son. And it is with equal measures of joy and sorrow that I accept the honor of addressing you now as we celebrate the life and mourn the passing of the Queen of Science Fiction. I’m joined today by my brother, the author Todd McCaffrey, and my sister, Georgeanne, her husband, Geoffrey, and their son Owen. My daughters Eliza and Amelia couldn’t be here, nor was Todd’s daughter Ceara able to join us. Yet this list is far from being the sum of Anne McCaffrey’s family. Beyond my Mother’s legendary accomplishments as a writer, she was first and foremost a magnificent human being with the largest heart that ever warmed so many in its loving embrace. Her home, Dragonhold, boasts several lovely fireplaces, but it is the hearth erected from her heart, the vast mantle of which includes so many present here and even more unable to join us today. My mother was like a river to her family and her friends. Many here will recall the zeal with which she approached Christmas when Dragonhold became a veritable warehouse of gift baskets from floor to ceiling, filling room after room. I doubt Santa had any elf more devoted to the Yuletide than Anne McCaffrey. Yet the greatest gift I ever received from my Mother was her love. With every atom of my being I knew she loved me unconditionally and that gave me the confidence to grow and become the man she was so very proud of. Looking around this room, I know I’m not the only recipient of this gift. I’m sure Derval Diamond and her Daughter Jennifer received it. I know all the Callahan sisters did. 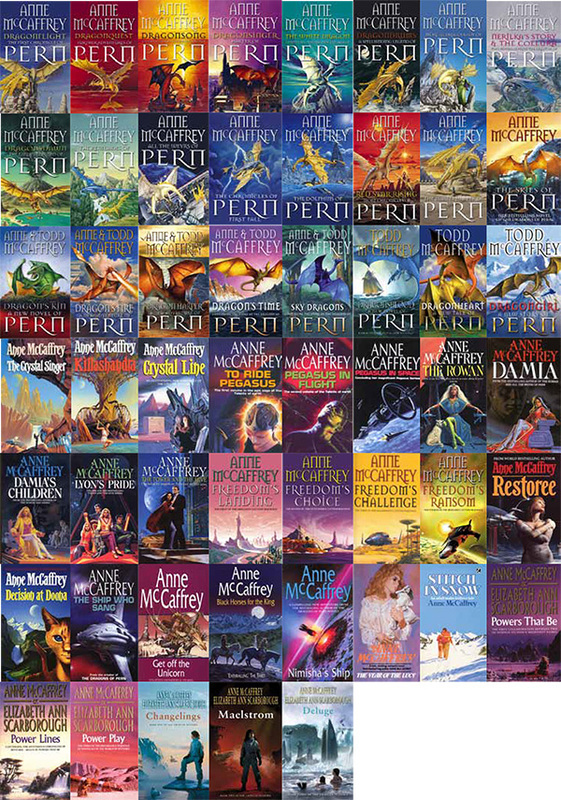 Maureen Beirne, Ceara O’Connor, Maryanne McCarty, Margaret Kennedy, and too many others to name here, all knew Anne McCaffrey’s love. And when our family joined the Kennedy clan through Gigi’s marriage to Geoff, our Irish family became delightfully enlarged, extending my Mother’s hearth further still. One of my earliest memories of family life with my Mother was a time when we were gathered around the television watching “The Wizard of Oz.” Mom loved it as much as we did and I’ve lost count of the number of times we watched it together. I’m reminded of this because of the Tin Man and what the Wizard told him about the heart he longed to possess. “A heart is not judged by how much you love, but by how much you are loved by others.” By this measure there is no limit to my Mother’s heart. Since the day she passed and even now as I stand here before you, your love for her comes over me like warm, sweet sunrise. Anne McCaffrey could enjoy no finer legacy than this we all bear witness to today. And what a blessing it is that we are bound together today by mystic chords, spun from our memory of this truly remarkable woman and the love we share with her that not even death can diminish. Mum wants me to relay to you how terribly sorry she is to have to cancel this year’s apperance at Dragon*con. What seemed to be indigestion last week has now turned out to be something more serious – some incident with her heart, the full details of which are still to be determined by tests. The Directors at Dragon*con have said that she’s to rest and get better so she can come next year.